THC / CBD Sprays taste excellent, are easy to use and leave a pleasant smell on your breath. No smoke! THC Spray patients are finding a new and safer way to medicate with medical cannabis — Discrete, Fast & Effective. The sprays also come in 3 different sizes. Our 3ML THC Spray can produce from 3 to 5 Doses – 75 mg THC. $15 at your local collective. Our 5ML THC Spray can produce from 5 to 7 Doses – 125 mg THC. $25 at your local collective. Our 10ML THC Spray can produce from 10 to 14 Doses – 250 mg THC. $50 at your local collective. 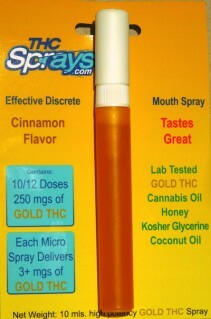 THC Sprays are an amazing innovation and a great alternative to smoking cannabis. Here are just a few of the great qualities of THC Sprays. THC /CBD Spray patients are finding a new and safer way to medicate with medical cannabis — Discrete, Fast & Effective. THC / CBD Sprays taste great, are easy to use and leave a pleasant smell. Dosage Control, Titration, when you have reached your proper dosage and you are comfortable… you automatically stop. THC / CBD Sprays do not create a craving for more, only for the level you need, nothing more. It’s perfect. THC Sprays are a NEW smoke-free way to medicate without sacrificing the euphoric high of smoked cannabis. Maintain your cannabinoid levels without continually needing to smoke more. THC Sprays help cut down on the smoking of cannabis and definitely extends and enhances the cannabis you do smoke. You will smoke less and your valuable Cannabis will last longer, saving you money. Each batch of THC / CBD Sprays are tested by a premier state of the art laboratory specifically staffed and equipped with the latest in technology to bring our Co-Op members the finest in Cannabis medicine. Our Cannabis is grown organically ensuring quality methods are used with no herbicides or chemicals added, applied or allowed. Our medicine is only available through collectives or delivery services. Please contact us or see our Collective Listing page to see the nearest Co-Op or Delivery Service to your neighborhood. Information can be found below. Ordering or product inquiry is easy. Contact us with your Collectives name, your name, phone number and best time to reach you. Please provide your address or if a delivery service, the area you serve. *Our form provides a space for your mailing address, simply to send you a rack of brochures and a 8 X 11 inch laminated poster. We constantly receive inquiries of where to purchase our medicine. Get your collective listed for FREE. Once your collective’s order is filled, you will be listed as a resource on our web site for FREE. Patients will be directed to your service. Your collective’s listed position will be in the order in which it was received. 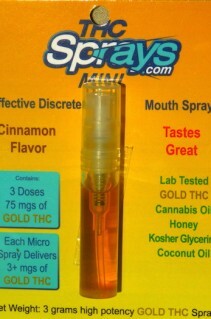 THC Sprays are an incredible medicinal cannibas mouth spray! Contact us today to order or visit your local collective. Copyright 2016 THC/CBD Spray. All Rights Reserved.